⋅ Students come from 44 states, 44 countries, and the District of Columbia. ⋅ 98% of enrolling students receive gift aid. Independent, four-year, residential liberal arts and sciences college; chartered in 1846, Beloit is Wisconsin’s oldest college. Founded by Yale graduates to educate students for a rapidly changing world in the mid-19th century, Beloit’s rigorous yet flexible curriculum continues to prepare students to make a remarkable impact in the world. Graduates of Beloit possess a range of in-demand skills, including the ability to make connections across disciplines; lead others from diverse backgrounds; think critically and creatively; test, reflect, and communicate well; and extract meaning from information. Located in south-central Wisconsin, Beloit (pop. 36,000) is 90 miles northwest of Chicago and about an hour’s drive south of Madison, both easily and inexpensively reached by bus. Milwaukee is 70 miles northeast of Beloit. Beloit’s 40-acre New England-style campus is situated on river bluffs, dotted with ancient North American Indian mounds, and adjacent to historic College Park, a residential neighborhood of Victorian homes. The college is currently in the process of converting a decommissioned power plant along the nearby Rock River into “The Powerhouse.” Designed by MacArthur Prize winning architect Jeanne Gang and her Studio Gang firm, the Powerhouse building is scheduled to open in fall 2019 and will be a state-of-the-art, sustainable student union, recreation center, and athletics facility for Beloit students, faculty, and staff. This Platinum level LEED-certified, environmentally sustainable building houses seven different departments on campus. The innovative design of classroom and laboratory spaces encourages interdisciplinary learning, critical for today’s science students to take a leadership role in 21st century science. Beloit College believes that the broadest — and best — education includes opportunities outside the classroom to test, integrate, and evaluate knowledge and skills learned in the classroom. Both a place and a cornerstone of the academic program, the Liberal Arts in Practice Center at Beloit guides students to internships, research opportunities, service in the community, and networks that mesh their academic work with career goals. At Beloit, students build more than a transcript; they build a resume. Located in downtown Beloit, just two blocks from campus, the Hendricks Center for the Arts is the centralized home of the college’s dance and music programs. An innovative adaptation to the 48,000-square-foot historic building (once a post office, then the public library), the space includes an orchestral room, many practice rooms, four studio classrooms, a state-of-the-art film classroom, design and staging labs. Beloit College is committed to making our high value education affordable for students from all economic backgrounds. We routinely appear among top schools rated as a “Best Value,” due to our robust financial aid program of merit and need-based aid. Between 2017 and 2018, we jumped nearly 60 spots in our Washington Monthly ranking—going from #95 to #38— because of factors like our low net price. Our Net Price Calculator can provide guidance on the aid available based on your family’s circumstances. About 40% of all Beloit students spend a semester studying abroad. Programs are available in China, Ecuador, England, Germany, Hong Kong, Hungary, Italy, Japan, Morocco, the Netherlands, Norway, Russia, Senegal, and other countries. Visit www.beloit.edu/oie/offcampus/explore/ for more information on international education. The Beloit Residencies program brings as many as seven distinguished scholars to campus each year to teach and work with students. 95% of full-time faculty hold the most advanced degree in their field. The Advising Practicum, a full-day series of workshops and discussions held every semester before advising week, exemplifies the central role that advising plays in a Beloit education. The Practicum is designed to help students develop an academic plan tailored to the student’s particular goals and interests, and to be prepared to take advantage of the many resources available. For the most current listings, please check the college website. Beloit also offers programs leading to licensure in drama and foreign language education (early childhood/adolescence) through the adolescence and schools track. Beloit is a Midwestern campus with international flair; 15% of the student body come from countries outside of the United States. Every year, all students share their experiences with international education during a day-long International Symposium. There are many ways to be active at Beloit. On campus, there are nearly 60 active student-run clubs and organizations, including intramural and club sports. Nearly 30% of the student body participates on one of Beloit’s 19 NCAA Division III varsity sports teams. 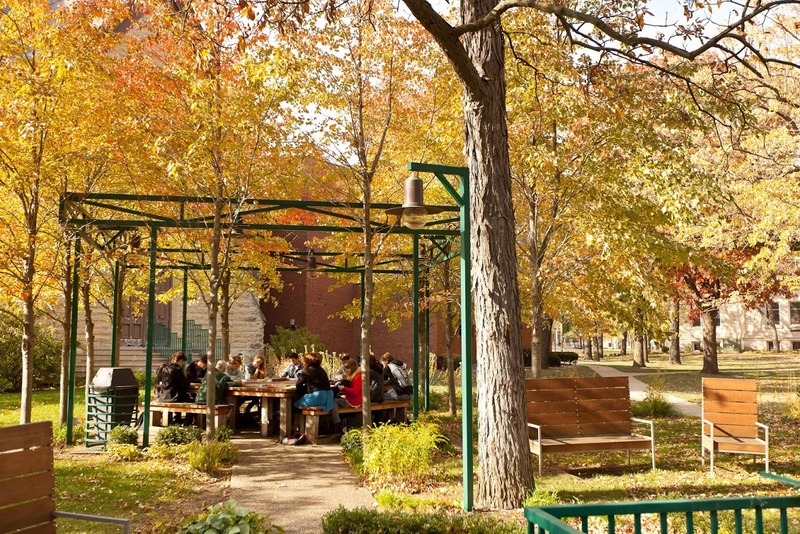 Riverside Park, located on the banks of the Rock River, is within walking distance of campus. Riverside has 3.5 miles of paved trails perfect for walking, running, or biking; the park also has tennis courts, tandem bike rentals, and a lagoon perfect for paddle boating adventures. 95% of students live on campus, either in residence halls, special interest houses, or sorority and fraternity houses. Frisbee golf is a favorite campus pastime. The course winds in and out of century-old trees, stretches the entire length of the 40-acre campus, and is open year-round. 93% of our most recent grads were employed, in graduate school, or engaged in volunteer or service opportunities within 6 months of graduation. Beloit, Wisconsin, is a short distance from three major cities—Madison, Milwaukee, and Chicago—where students frequently intern and land their first jobs.While Wisconsin, Illinois, and Minnesota are the top three geographic destinations for Beloit grads, graduates of the class of 2017 took opportunities in 28 states and 19 countries. Non-U.S. destinations were the third most popular destination for 2017 graduates. To learn more about how Beloit students are putting the liberal arts into practice in preparation for their future, go to www.beloit.edu/giving/impact/. 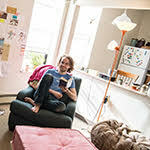 The College Search A liberal arts education: Is there real world value? The College Search Does Anyone Read All Those College Applications?